I love Steam. How could I not? Browsing Steam for games often feels like browsing a buffet full of my favorite dishes, all made especially for me and ready to eat at a moment's notice. Almost anything I could ever want is right there, and all I need to do for another spoonful of gaming goodness is click a few buttons. Of course, that's only the half of it. The most recent Steam Holiday Sale bordered on unreal. Just imagine if Steam's pricing applied to everything else: You could buy an HDTV for $50 or a McDonald's Double Cheeseburger for $0.25. This absurd pricing, among other things, has made Steam hugely successful. When Steam was released in September of 2003 alongside Half-Life 2, no one was even sure if there was a market for digital distribution. Since then, Steam has come to dominate the rapidly growing digital distribution market, achieving an active user base of around 25 million. Steam is positioned to have considerable influence on the future of gaming, and at first glance the future seems bright. Yet there is a niggle in the back of my mind, a suspicion growing too large to ignore: Is Steam becoming a monopoly? I can hear some readers crying out, "Blasphemy!" Surely Valve would never allow Steam to take actions like those of Microsoft, a company which was prosecuted for its anti-competitive practices with varying degrees of success in countries across the globe. 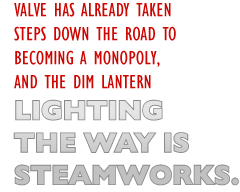 But, in fact, Valve has already taken steps down this dark and dangerous road, and the dim lantern lighting the way is Steamworks. Steamworks is an application programming interface (API) offered by Valve which allows third-party publishers to integrate their games into Steam. For publishers, this idea is the bee's knees: Using Steamworks grants access to Steam's authentication services, Steam's community features and Steam's ability to rapidly deliver patches and DLC. These are all features that publishers would ideally provide anyway, but Steam has them built and ready to go for the low price of absolutely free. As a result, such popular titles as Modern Warfare 2 and Dawn of War 2 have jumped on the Steamworks bandwagon. There's a catch, however: Once a publisher elects to use Steamworks in one of its titles, its customers must use Steam to play it - no exceptions. Publishers don't mind this, because it's easier for customers to purchase a publisher's other titles when the Steam client is installed and ready to go by default. But for competitors to Steam, like Direct2Drive and Impulse, Steamworks is the end of days. Brad Wardell commented on Steamworks in the 2009 Stardock Customer Report, saying "Once a game requires Steamworks, it is effectively cut off from us, which limits our content." These words, however, are like honey compared to those of Direct2Drive. When Direct2Drive decided not to carry the blockbuster Modern Warfare 2, Gamasutra asked the company for comment. In reply, Direct2Drive stated, "We don't believe games should force the user to install a Trojan Horse."